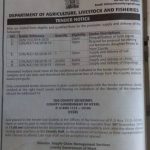 Nyeri County has a total of 7 slaughter houses. 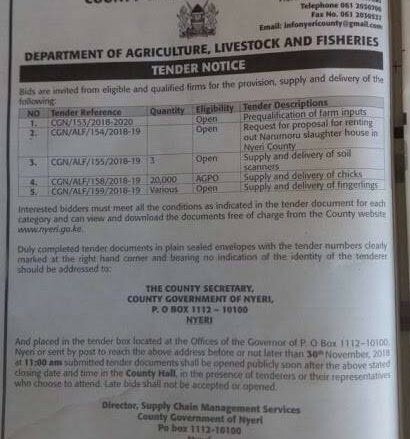 2 of these have already been leased and in Standard paper dated 16th November, 2018 page 20, the County Government has placed an advert for expression of interest to lease out the Naromoru Slaughter House. Naromoru Slaughter House was established in the year 2011 as part of the Economic Stimulus Programme. Initially, all slaughter houses were under the management of the County Councils, butchers, stock traders or cooperatives formed by stakeholders until February, 2016 when they were handed over to the County Government. The facility which is located about 3km from Naromoru town has the capacity of 50 cattle or 100 goats/sheep per day. Other products such as hides/skins and manure are meant to serve the leather industry and biogas development. The Department of Animal Resource Management (Veterinary section) has been in charge of slaughter houses and hides and skins. On average, about 385 cattle, 1141 sheep, 260 goats and 104 pigs are inspected in the County to ensure food security and to prevent public health hazards weekly. Those interested can pick forms or download the tender document here and follow the leasing procedure.